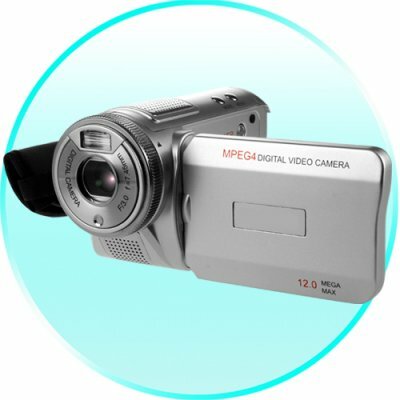 Successfully Added AVI Digital Camcorder - Digital Camera + PC Camera to your Shopping Cart. The great vacation camcorder! Vacations are all about fun and taking lots and lots of photos and videos so that you can show your family and all your friends. This camcorder with its built in digital still camera is the perfect companion for your next trip where ever it might be. With a simple insert of an SD card, you can instantly start taking photos from the second you power up this camcorder, eliminating all that complicated setup procedure and giving you bags of time for taking those instant videos and photos. This DVR camera is a three in one Digital Camcorder, which can operate as a high quality camcorder taking videos in AVI format, a Digital Camera, and even as a PC Web Camera. With the 1/2 Inch CMOS Sensor you will be capturing images at a high 5.0 Mega Pixels, and via interpolation, up to a 12 Mega Pixel shot can be taken. When you are ready to show your pictures and videos, either download them to your computer, or use the built in AV OUT to display them directly on your TV. This is a must have DVR camera, use it at your next home or office party of simply take it away with you on vacation to capture those memorable moments. As always, Chinavasion brings you the coolest in DVR gadgets at super low China wholesale prices. Click "Add to Cart" now, and we'll ship you a sample right away. Is this camcorder compatible with my Mac (or Linux) computer? Yes, for USB file transfer it is compatible with most computer types. However the included software is only for Windows PC's. Nice little camcorder - uses SD cards - was charged £26 customs though, which added a lot to my costs. Makes nice little videos for quick uploading to PC or web. Photos are decent quality, they don't respond fast though, so I've had a number of photos which were blurred.